The report you are about to read is one of six “exploratory studies” commissioned by the UN Environment TEEB Office, funded by the Norwegian Agency for Development Cooperation, and carried out by the World Agroforestry Centre (ICRAF), to begin building an evidence base to feed into the wider initiative on TEEB for Agriculture & Food (TEEBAgriFood). The original purpose of these studies was to assess the impacts and dependencies arising from particular agricultural sectors and systems. 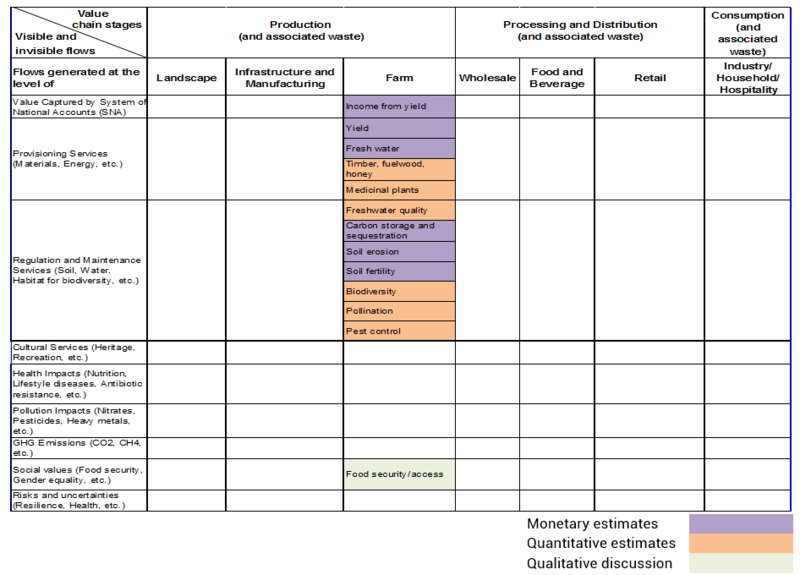 The purpose of this section is to assess how well the Agroforestry exploratory study aligns with the Framework, and how comprehensively this study has identified and valued the impacts and dependencies of this particular agricultural sector on ecosystems and human wellbeing across all stages of the food value chain. This study on Agroforestry focused predominantly on the production phase. Within this stage, it concentrated on the site-level and looked at several dimensions within the farm gate; however, it largely overlooked wider landscape changes and aspects related to infrastructure and manufacturing. Subsequent stages along the value chain were not considered within the scope of this study, neither processing/distribution nor consumption, or the waste generated across each stage. For instance, in the production stage, further research should address evaluation of impacts at the landscape level, such as habitat condition and quality to provide ecosystem services supporting the sector over time, deforestation, biodiversity loss and carbon capture capacity. Also, when considering infrastructure/manufacturing, more attention could be paid to e.g. sourcing of inputs, labour and land rights. Plus, within the farm gate, additional aspects like e.g. cultural heritage practices related to mixed cultivation systems, gender, livelihoods, health impacts of agrochemical application and certification systems shall be considered. Further, along the processing/distribution stage, dimensions related to supply and development of markets for timber and non-timber forest products through wholesale, retail and food and beverage outlets should be taken into consideration. For example, transportation and greenhouse gas emissions, import/export barriers and enablers, as well as packaging and associated waste. Finally, during the consumption stage, effects that should be looked at within industries, households and hospitality outlets include food security, nutrition and diets, seasonal consumption, consumer information, availability of substitutes, waste and disposal. Further research will, therefore, bring about a more comprehensive and holistic assessment of the impacts and dependencies of the Agroforestry sector on ecosystems and human wellbeing, that can better inform policy and practice aimed to achieve sustainability and social value for the sector. Full Study Agroforestry: an attractive REDD+ policy option?